Third Party Advertising: What is affiliate marketing? If you're a serious online advertiser or publisher you should be extremely familiar with what affiliate marketing is, how it works, and how you can make a profit using it. I'll only cover the first two topics in this post, but will follow up in later posts about making money with affiliate marketing. Affiliate marketing is a marketing practice in which a business rewards one or more affiliates for each visitor or customer brought about by the affiliate's own marketing efforts. Examples include rewards sites, where users are rewarded with cash or gifts, for the completion of an offer, and the referral of others to the site. The industry has four core players: the merchant (also known as 'retailer' or 'brand'), the network, the publisher (also known as 'the affiliate'), and the customer (the end user who is making a purchase). The market has grown in complexity to warrant a secondary tier of players, including affiliate management agencies, super-affiliates and specialized third parties vendors, but we wouldn't dig too deep into those here. Cost per action/sale affiliate marketing methods require that referred visitors do more than visit the advertiser's website before the affiliate receives commission. The advertiser must convert that visitor (turn that visitor into a paying customer) first, before the affiliate is paid. It is in the best interest for the affiliate to send the most closely targeted traffic to the advertiser as possible to increase the chance of a conversion. The risk and loss is shared between the affiliate and the advertiser. Merchants favor affiliate marketing because of this "pay for performance" model, meaning that the merchant does not incur a marketing expense unless results are accrued (excluding any initial setup cost). Some businesses owe much of their success to this marketing technique, a notable example being Amazon.com. 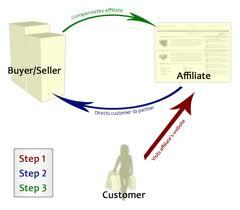 Unlike display advertising, however, affiliate marketing is not easily scalable. Affiliate marketing isn’t the only way to make money from websites and it won’t suit every publisher but there are a few reasons why it can be profitable to you as a publisher. Perhaps the biggest of these reasons is that affiliate marketing seems to work best when there’s a relationship of trust between the publisher and their readership. I’ve found that as this trust deepens that readers are more likely to follow the recommendations that a blogger makes. Of course this can also be a negative with affiliate marketing – promote the wrong product and trust can be broken.